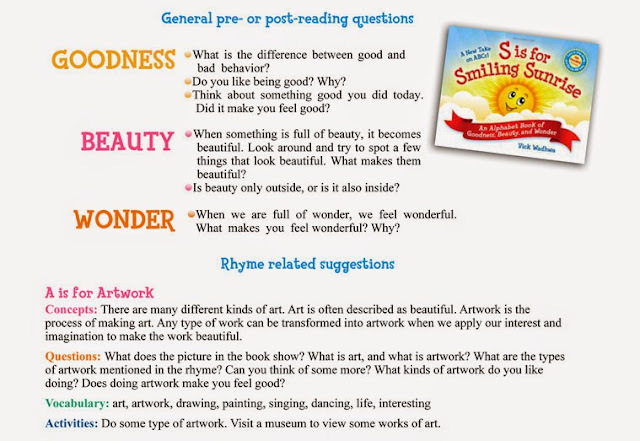 When asked if River, age 6, and I would be interested in receiving and reviewing the book S is For Smiling Sunrise, published by WordsBright, I offered a hesitant "sure"; while River has discovered a love of reading I wasn't sure if this book would be challenging enough for him, given that he's outgrown traditional ABC books. 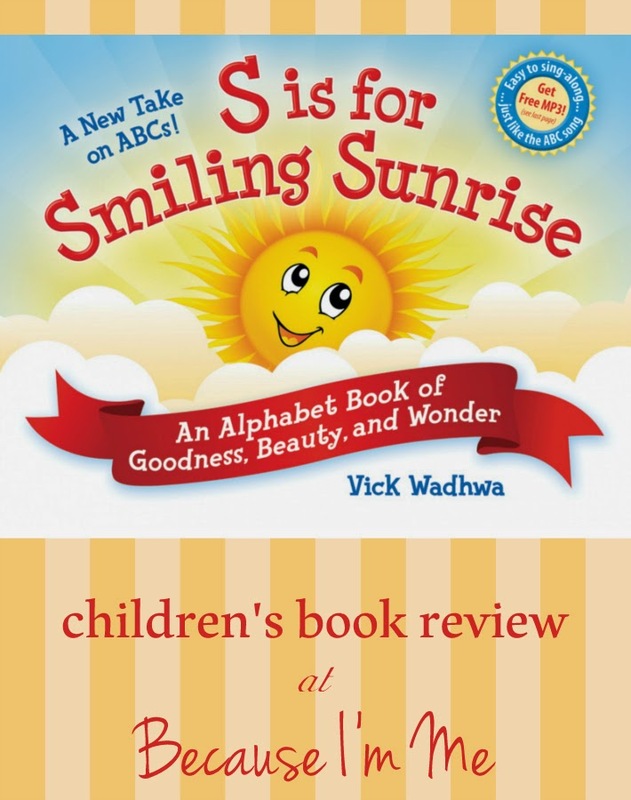 S is for Smiling Sunrise isn't your average ABC book and River dove right into the book, and enjoyed it very much. The hardcover, full-color, illustrated book written by Vick Wadhwa is recommended for children ages 3-6. The book contains about 30 pages, all of which are of a high quality, thick, glossy finish (ie - not going to rip easily). As I mentioned, this isn't a typical ABC book. Instead of "A is for Apple" in this book A is for Artwork - drawing and painting, and singing and dancing. The other alphabet letters in the book are equally unique, with C representing colors and H for heart. 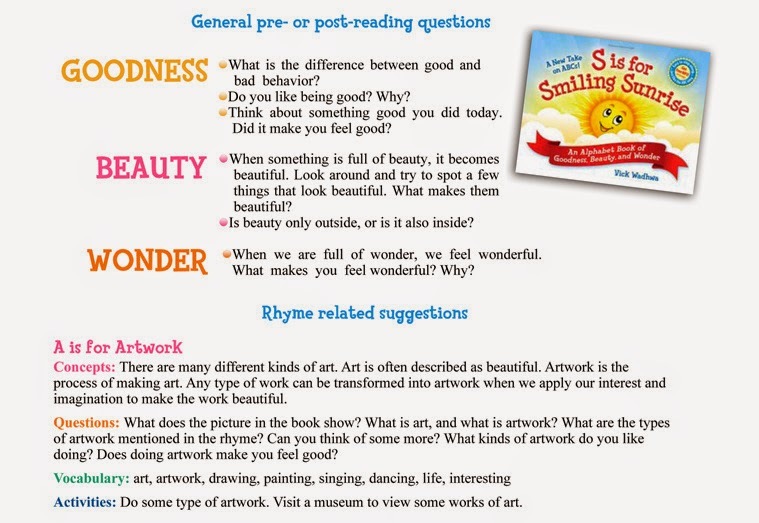 Instead of focusing on beginning words the book focuses on seeing and thinking about beautiful things, and taking time to stop, pay attention, and appreciate the world around us. At Cub Scouts River has been working on his photography beltloop. One of his requirements was to submit 10 photos that he took using tips he'd learned about photography. I tied this book in with that requirement, as photography also requires you to slow down and observe what's going on around you. Focusing on the subjects of the book gave him something to look for instead of just taking random photos. I'd like to say that these are all River's pictures, but he got sidetracked when we discovered an armadillo shell and bones, so some of these were taken by one of his brothers who, once he got a hold of the camera, didn't put it down all day. There is also a CD included with the book, with one song on it retelling the book. Personally, we preferred the book without the song, once I heard the song I had a hard time going back to the book and taking the "singing" out of the reading, if that makes sense. I found the song more of a distraction than an aide. River, nearing the end of First Grade, had no problem at all reading the book on his own. He liked the pictures and the variety of information in the book. Between the book and our discussion of the pages he did some great learning and thinking. There were some challenging words mixed in which was good for him. Is it a book he'll read again and again? Probably not, only because he's just at the cusp of being a little too old for the book, or it being a little too young for him. I appreciated that S is For Smiling Sunrise encouraged River to look around and notice the world, and to think about the things he was reading. Had I had this book when I had my daycare I'd have gotten a lot of use out of it, tying craft projects in with the pretty pages of the book. For example, these adorable hand print caterpillars would have been tied in well with "B is for Butterfly". I'm sure I could have found projects that would have worked for each of the 26 letters, combining the book with the discussion questions, letter drawing, craft projects, and activities would have been a lot of fun for the kids and for me. 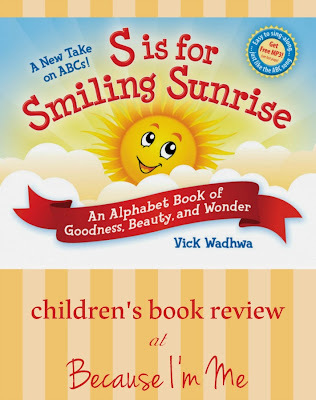 S is for Smiling Sunrise is available through WordsBright Publishing, with discounts for bulk orders.